Nails to be cut short; the little finger is never used; thumbs always upright; index finger always kept well away, distant from the thumbs. Before beginning of a scale passage, always fix the four fingers on the four strings (from “A simple method of learning to play the old Irish harp” book by Madame Cecilia Praetorius, 1890). The book may be old, but the message is ever present: playing an Irish harp is extremely demanding on discipline, technique, and of course, desire. And fortunately for the world, one Máire Ni Chathasaigh possesses them all. Born at Cork City, Ireland, in 1956, Máire Ni Chathasaigh (pronounced Moira Nee Ha-ha-sig) has been the Irish harp devotee since she was only 11, and become one of Ireland’s most important and influential traditional musicians. She grew up playing both traditional Irish music and classical music in parallel. Her earliest musical training was with her mother, while the traditional music education was provided within the family and through membership of the Cork Pipers’ Club. Eager to play traditional Irish dance music on the harp – tunes that she had been playing on the tin whistle and fiddle—she developed her own special techniques “a single-handed reinvention of the harp” necessary to perform it in an authentic-sounding style, which she still use to this day. At the age of 21, she had the proper harp tuition when a pedal harpist Denise Kelly came to Cork to teach at the School of Music, and gave her good grounding in classical harping. As a full grown artist, Máire has performed at many harp festivals around the world. 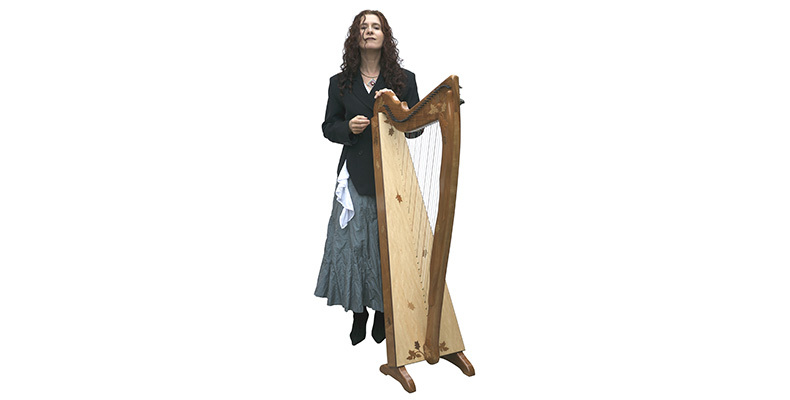 As the only Irish headline performer at the 11th World Harp Congress held in Vancouver in 2011, she represented both the Irish harp and Irish musical traditions. Other notable harp festival appearances have included the 2010 Istanbul Harp Encounter (part of that city’s European City of Culture celebrations), the Edinburgh Harp Festival (on eight occasions), and the World Harp Festival in Cardiff, UK. Máire also holds the First prize in All-Ireland and Pan-Celtic Harp Competitions on a number of occasions. In 2001, she received Irish music’s most prestigious award, that of Traditional Musician of the Year – Gradam Cheoil TG4 – “for the excellence and pioneering force of her music, the remarkable growth she has brought to the music of the harp and for the positive influence she has had on the young generation of harpers”. In this day and age, where instrument like the Irish harp is hardly ever noticed by the 21st century children, and where the ‘reality’ no longer stimulates the musician’s excellence in techniques mastery, we are very fortunate to have Máire Ni Chathasaigh, who has long endured, cherished, and desired the Irish Harp’s playing in perfection. Celtic music is found in many areas across Europe, from Spain, France, England, Wales, Scotland to Ireland. What is the common denominator(s) among them, and what are the unique features of each? Linguistically, the Celtic languages can be divided into two branches: P-Celtic and Q-Celtic. The languages currently spoken in Ireland and the Highlands of Scotland, and in the past in the Isle of Man, belong to the Q-Celtic branch and are closely related. Welsh, Cornish and Breton belong to the P-Celtic branch and are closely related. Though there would be no mutual comprehension between the speakers of Irish and Welsh, for example, the languages when examined are similar in grammar and syntax. The civilization of medieval Wales was however similar to that of Ireland in social organization, literature, myth and legend and in the primacy of the harp in musical expression. Irish and Scottish musical traditions are closely related, but are very different to Welsh, Cornish and Breton musical traditions – certainly in the form in which they’ve survived into modern times. There are no obvious common denominators. So, strictly speaking, one can speak of Pan-Celtic language, culture, civilization, art – but not of a Pan-Celtic musical language. In the music market, Celtic is one of the most well-known among the world’s roots music with Latin and African as perhaps the main “competitors”. How do you think Celtic music reaches that level in the world? Even though “Celtic” is not a good or accurate label artistically or historically, as a commercial construct it has been inspired! It’s the best marketing wheeze ever thought up by a record company. What Celtic music means to its people? And what it means to you personally? I can only talk about Irish music, which is immensely important to Irish people and intimately bound up with our sense of self. It is hugely important to me personally and is the conduit through which I choose to express myself artistically. What kind of influence and/or contribution do you think that Celtic music has given to the world of music? There are quite a few women in Celtic music, but only a handful playing the Celtic Harp that includes you of course. Why is that? What made you decide to take on the harp? My mother tells me that I’d always wanted to play the harp (though I have no recollection of this), so therefore they bought me one when the opportunity arose. I was eleven at the time. There are now lots of female harpers in Ireland, but only a handful who play professionally. 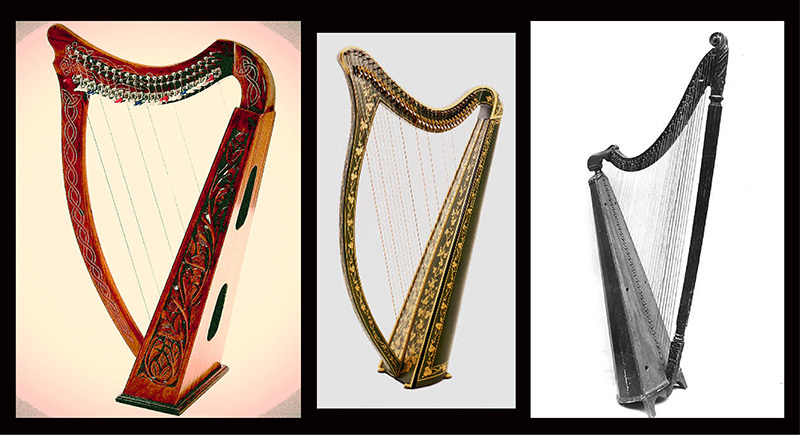 How different is the Celtic harp compare to other harps, phisycally? Does it require specific playing techniques as well? There isn’t really such a thing as a Celtic Harp, historically speaking. A very specific type of harp – usually referred to as the Ancient Irish Harp – was played in Ireland and Scotland for over a thousand years, until the beginning of the nineteenth century. It had several unique features: its forepillar had a pronounced curve and was T-shaped in section; its soundbox was hollowed out of one piece of solid willow attached to a soundboard; it was strung with brass and played with long nails; it was held on the left shoulder; the melody was played with the left hand and the accompaniment with the right; since it was very reverberant, the harpers used very complex stopping techniques to shape phrases. At the beginning of the nineteenth century, this harp was replaced by what is often called the Neo-Irish Harp. This looked superficially like the old Irish harp in that it had a curved forepillar, but it was constructed in a modern manner and played with the pads of the fingers and is the harp, with the addition of modern refinements, that we still play today. It is the harp people normally mean when they refer to the Celtic Harp. The Welsh harp, by contrast, was always physically very different, and still is so today, though it too was played on the left shoulder. The Irish/Scottish harp in itself does not require specific performance techniques. However, the stylistically correct performance of Irish dance music does require the use of specific techniques. The techniques I developed for this purpose in the 1970s – there had hitherto been no tradition of dance music performance on the Irish harp – have since then been widely adopted. Music in general has transformed into a subject that is merely treated as entertaining and income generating activity. Its other roles and functions, along with its ritual side, continue to disappear. Does this happen to Celtic music as well? Shall musicians and societies accept this change as the future way of looking at music? Traditional Irish music’s “other roles and functions, along with its ritual side” do seem to be “continuing to disappear”. A number of older musicians in Ireland feel despondent about this change, which from their point of view dates from the creation of the “Celtic Music” marketing brand and the subsumation of Irish music into that. I am much more optimistic, however. I know from personal experience that it is possible to be a professional musician (i.e., “entertain and generate income”) and be true to oneself artistically. It’s unfortunately the case that many musicians for whom commercial success is of over-riding importance do abandon any ambition to touch the heart – with the result that music which is heavily hyped and expensively marketed tends so often to lack soul. But I have a lot of faith in people’s capacity to be moved by music and am constantly amazed by it. Music is the most abstract of all art forms, while at the same time being the most emotionally transfixing. I know that certain 17th century Irish harp airs have the capacity to pierce the heart of the most unpromising audience. Such moments can’t be faked or forced and are what make performance so endlessly rewarding. We must never accept the commodification of music. As artists we must make common cause with and draw strength from others with the same ethic and world view – and remember that the environmental movement was once considered to be hopelessly romantic and impractical! Fame and fortune also seem to replace passion as the instrument in measuring the “success” of an artist. How do you reply to this matter? To me, passion is all-important. How do the young in UK perceives and (un)appreciates Celtic music? The young in England are generally speaking uninterested in Celtic music. Large numbers of older people like it very much, I’m happy to say, as our concerts in England are usually very well-attended! They are however perhaps not so emotionally attached to it, as England is not a Celtic country. A good percentage of the young in Celtic countries like Scotland and Ireland are very interested and engaged with the music. Roots music such as Celtic is very much associated with acoustic instruments. Do the growing use of electric instruments and digitalization affect the acoustic features of Celtic music? You have travelled distances to perform, and have had many chances in getting acquainted with music of other cultures. Any of them that inspire or impress you more than the others? And why? Even the most cheerful Irish music often has a melancholy undertow: I love this duality of mood in music, so am naturally attracted to other music which shares these characteristics – Swedish, Old-Time American, Eastern European, Middle- and Far-Eastern… Traditional African music has a gentle, limpid quality that is immensely attractive. You certainly were born to be an an artist; but at what age did you decide that music is your thing? When at school, I was interested in everything and studied as wide a range of subjects as I possibly could. I was very fortunate that the school facilitated this, as Irish schools these days would be far too concerned with the accumulation of the maximum number of points towards university entrance to allow me to get such a broad exposure to so many diverse disciplines. I was accepted into the Medical School in University College Cork, but changed my mind on the day of registration when I realised that medical studies would leave very little time for playing music! I decided upon Celtic Studies – the study of Irish, Welsh and early Irish history – instead. After completion of a post-graduate teaching diploma, I embarked on a music degree, but after one year of this my parents “suggested” that I might like to get a job! I taught in a second-level school for three years, during which time I became convinced that the creative life was for me not a choice but a necessity. I therefore resigned from what was a very well-paid position and embarked on the insecure but rewarding career of a professional musician. Who influence and/or inspire you the most, and why them? So many things inspire me – not just music, but poetry, art… I’ve always been drawn to the music of Bach: so intricate and perfectly balanced. In terms of traditional music, I’ve always loved the singing of Máire Áine Nic Dhonncha (d.1991) and the piping of Willie Clancy (d. 1973): their music is endlessly subtle and creative. Did you have a dream(s) that you have lived it? Anymore is yet you would like to live in? It’s great that you still remember Sacred Rhythm Festival at the Nijo Castle in Kyoto. Would you join again if Sacred Bridge Foundation organized another cultural event? Trust your instincts. Don’t allow marketing men to convince you that black is white: beauty in music is life-enhancing and its absence saps the spirit. …And any words of wisdom for Listen To The World? No words of wisdom, I’m afraid! I will simply say that I love Listen to the World’s ethos and its ambition to present the real, the true and the beautiful in music. Thank you very much Maire for your time, your kindness in taking this interview, and most of all, your contribution to music.